Fellow coffee lovers, do I have a treat for you. These mocha swirl sticky buns combine two of the best things in life – coffee and chocolate! 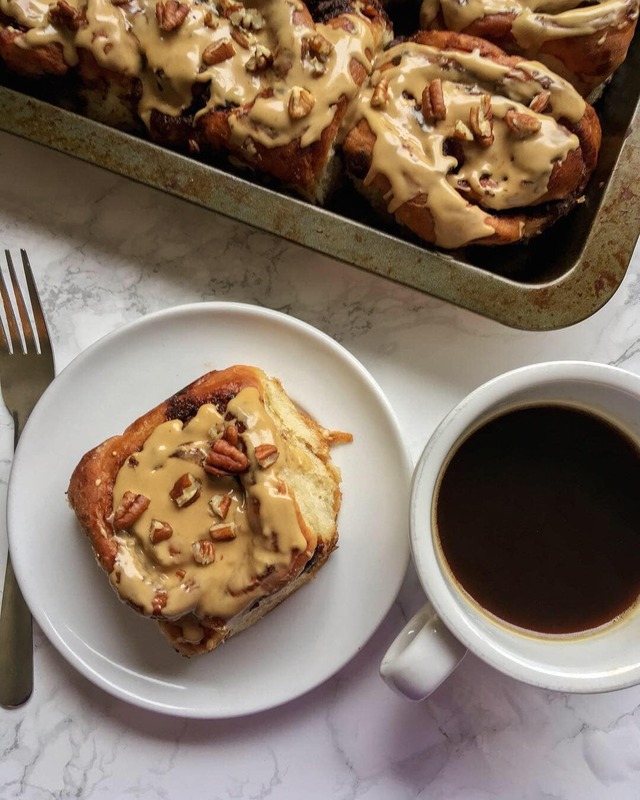 These soft, fluffy buns are filled with a brown sugar espresso swirl, chopped pecans, chocolate chunks and drizzled with an espresso-maple icing. They are unashamedly decadent. Yes, they are rich, but not so rich it would stop you from reaching for a second one. Or maybe that’s just me. My favourite element of these buns? The espresso-maple icing. I was seriously tempted to dive into the bowl and face plant the whole darn lot. If you’re a coffee lover like me, you will be in heaven. I promise! As much as I love my pumpkin cinnamon rolls, these really are something else. I won’t lie – these buns do take a bit of effort to make, but I promise you that as soon as you sink your teeth into one, you’ll agree that they are totally worth it! Do bear in mind that enriched dough – sweet dough containing butter, sugar and eggs – can take a bit longer to rise than a normal bread dough, so if it looks like nothing is happening, don’t worry. Depending on the temperature of your kitchen, the dough can take up to 2 hours to rise. Go and watch a movie, read a good book or go for a walk while you wait! Disclosure – this post contains affiliate links, which means that I will earn a small amount of commission (at no extra cost to you) if you decide to purchase the items advertised, which in turn enables me to bring you all these recipes for free…thank you! 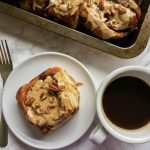 soft, fluffy sticky buns filled with a brown sugar espresso swirl, chopped pecans, chocolate chunks and drizzled with an espresso-maple icing! Place the flour in the bowl of a mixer and place the salt and yeast on separate sides of the bowl. Place the water, milk, butter and vanilla bean paste/extract in a small saucepan and heat very gently until the butter has melted. Don't let the mixture get too hot, you just want to warm it enough so the butter melts. Take off the heat and beat in the egg. Pour this mixture over the flour and knead for 5 minutes or until the dough is shiny, smooth and springy. Leave to prove for at least one hour or until at least doubled in size. When the dough has at least doubled in size, turn out onto a lightly floured work surface and roll out into a rectangle roughly 10x18 inches.Spread the soft butter all over the dough. Stir the brown sugar, ground cinnamon and espresso powder together and sprinkle all over the dough. Scatter over the chocolate chunks. Starting from one of the long ends, roll the dough up as tightly as you can. Cut into 10 equal pieces and place each piece in a lined baking tin, leaving room between each one to allow for rising. Leave to prove for around 45 minutes or until doubled in size. While the buns are rising, make the icing. Sieve the icing sugar in a medium sized bowl. Add the maple syrup and espresso powder and stir until you have a smooth icing. If it's a little thick, add a few drops of water to thin it down a little. Preheat the oven to 200c. Brush the tops of the buns with beaten egg and bake for 30-35 minutes or until golden, burnished and are smelling incredible.Remove from the oven and immediately pour over the coffee-maple icing and the chopped pecans, if using. Oh yum, I can imagine these being perfect with a latte. I love sticky buns! Thank you for sharing this recipe! Can’t wait to try it! thanks Jovina, they really are! These look really delicious, the topping is making my mouth water looking at it! One for the ‘must make’ list. Thanks, they are very decadent! Lol the lure of the sticky bun 🙂 me too! John and I loved that maple butter.